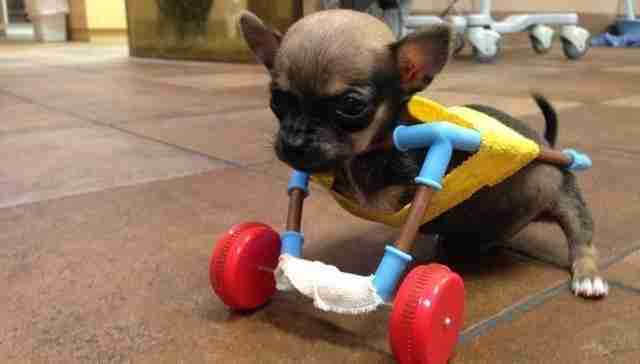 A tiny chihuahua named Turbo Roo, who was born without front limbs, has finally met the stranger who changed his life. When he first arrived into the world, there were some who saw Turbo's birth defects as making his a hopeless case. But he was fortunate to be put into the hands of the caring folks at the Downtown Veterinarian in Indianapolis this summer - they never considered putting the little dog down just because he had a disability. In hopes of helping Turbo keep up with his four-legged counterparts, vet staff built a mobility cart for him crafted out of toy parts. Their creation was hardly a wonder of engineering, but their dedication to helping the puppy garnered headlines nonetheless. Among those who read about Turbo was Mark Deadrick, owner of 3dyn, a San Diego-based company that fabricates parts for the aerospace industry. 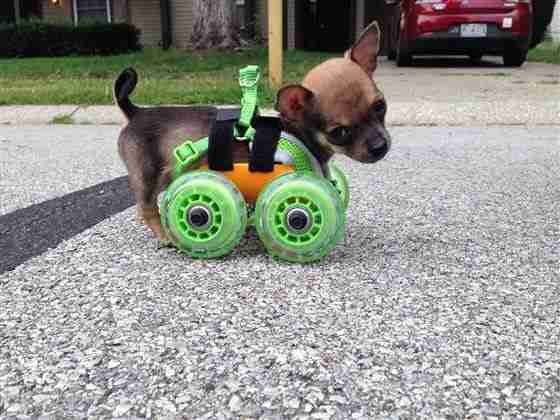 Deadrick suspected that, with his engineering skills and manufacturing equipment, he could design a better set of wheels for tiny Turbo. Mobility carts for canines do exist, but there were none on the market small enough to accommodate such a small dog. So, in his office hundreds of miles away, Deadrick took it upon himself to make one. "I mostly did this for the challenge. It's hard for me to pass up the opportunity to improve on a design, or just come up with a solution that doesn't exist already," Deadrick told The Dodo. "The industry standard for mobility carts leans toward larger dogs. Some people have been using them with their smaller dogs, but they are ridiculously too large and heavy." What Deadrick came up with was nothing short of life-changing for Turbo. His owner, vet technician Ashley Looper, said that after being fitted with custom-build cart, the little dog began to thrive with his newfound mobility. The design has undergone a number of changes since then to keep up with Turbo's growth. 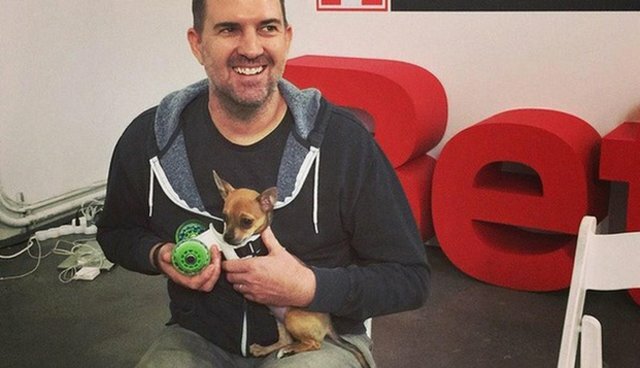 At the Better With Pets Summit in New York City last week, the little dog with a disability finally got to meet the man who went out of his way to improve his life. "It was great to meet Turbo and his humans in New York last week," says Deadrick. "I found it more interesting to see how much this project made others feel inspired, and I hope that inspiration can lead to others wanting to do similar projects, whether it's for pets or humans." Deadrick says that his work with helping the happy chihuahua isn't over quite yet. "Turbo seems to be doing quite well with his karts, but he is still growing, and we have a next evolution of kart for him in the works."